Promorepublic is the new kid on the block. Whether you’re a freelancer, small business owner, or other sort of social media professional, you NEED your social media tasks to be more efficient. You certainly don’t want to sacrifice quality, but you want to spend more time with customer contact, strategy and other activities that also drive business. There are plenty of automation tools out there to help you, but there are some things you should know about social media automation that will help you make the right decisions. Here are some tips on automating your social media marketing. You know you have to post high-quality content. It’s a competitive (read, it’s a jungle out there) and you want your posts to do their job, which is to create engagement and drive traffic. Social media automation tools (especially PromoRepublic) can help you do that. You can create and auto schedule posts on certain days to make sure you’re posting consistently. It is important, however, to make sure you don’t make your social feed look like you’re dialing it in. People pay attention these days. Holidays, events, special days and more can help you fill your social media calendar with timely, contextual and relevant posts that look thoughtful. Carelessly posting or robotic posting will make you look, well, like you don’t give a monkeys. Just because you have your posts scheduled (that’s just great time management) and you know they’re good doesn’t mean that you can never be present on social media. In fact, if your posts ARE doing their job, you can expect quite a bit of engagement on your posts. Since it’s vitally important for your social presence to have a real face and voice behind it, automating replies is a definite no-no. The clue is in the name…SOCIAL media. A word about retweets. There are people who retweet every tweet that mentions them. DO NOT DO THAT. It’s self promotional, it annoys people and it creates tons of Twitter clutter. Don’t be responsible for Twitter clutter. It’s all well and good to create posts your audience wants to see. But, if you post it at a time that they won’t see it, you aren’t doing your social media duties properly. Luckily, figuring out what time to post isn’t very hard and no, it’s not reading one of those ‘When to Post on Social Media articles’. They’re generic, not giving you the right guidance and assuming a one-size fits all approach. Certain automation tools can help you, but Facebook and Twitter have native apps that tell you all you need to know about optimising your posting times. You want to schedule posts that drive engagement AND be around to respond to comments and questions. So, combine point 2 with this point, because the very best social media marketers use their intuition and the analytics to tell them when to post, and when to be there to respond. We sort of glossed over it earlier, but notifications are some social media marketer’s favorite tools. Again, there are third party apps out there that will let you know when someone reacts on Facebook or Twitter, but those platforms have that option built right in. With Facebook, it’s under Settings>Notifications (I use Facebook Business Manager to manage my page if it looks a wee bit different). You can set email notifications or text notifications for messages, posts on your timeline, comments on your links, and more. Twitter is the same deal. 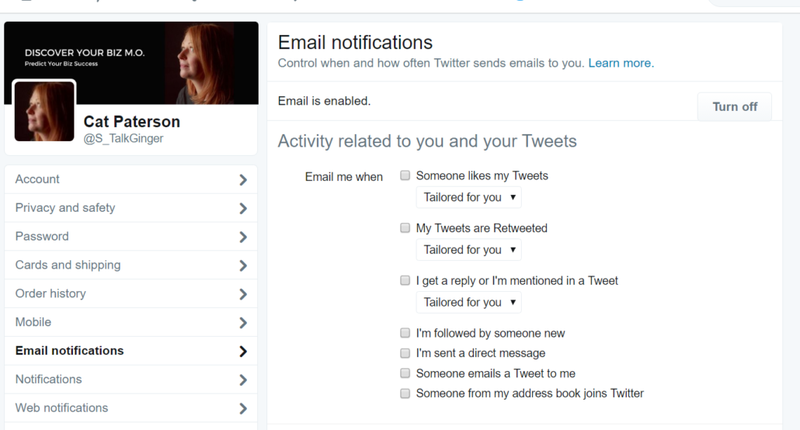 It’s under Settings>Email notifications and you can tell Twitter to email you when someone mentions you in a Tweet that’s liked and lots of other scenarios. You never have to miss a potential interaction on social media. You just have to decide how many emails you’re able to handle. You know the 5-3-2 rule, right? For every ten things you post, five should be content from others, three should be content from you, and two should be content that’s personal. Everybody’s definition of content from others, your own content and personal content differs. There’s also the Pareto 80/20 rule. 80% of other peoples content and 20% of yours. There’s one rule you shouldn’t deviate from. When you share content from others, you MUST make sure it’s relevant to your audience. There’s no point in posting recipes on your FB business page if you’re a hairdresser. That’s confusing for your audience no matter how much you love that cupcake recipe. Whether you’re sharing a blog post, someone else’s status, or retweeting, ALWAYS ALWAYS keep your audience in mind when choosing curated content. While there are plenty of tools out there, like Feedly, Zest and others, that will help you find relevant content to curate, this is a time where we believe it is especially important to listen closely to your social audiences and find content organically that is a good fit for your needs. The reason is, if you take yourself on your customer’s fact-finding and information mining mission, you will likely understand them better. And, once you find the right blog post or article that they want to see, before they know they want to see it, you know you’ve succeeded. Never miss an opportunity to connect with your social audience.